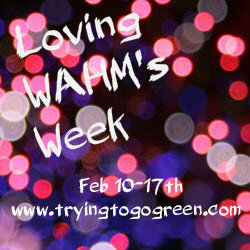 Today's WAHM is Tiffany and she runs Ecomama12 on facebook. She is a mother to two beautiful girls! 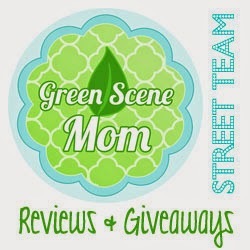 She makes menstrual/incontinence pads, cloth diapers, wetbags and more! I was sent a 10 inch Heavy/overnight pad which retails for $8.00 plus shipping. The top is 100% cotton flannel and the inside is two layers of zorb and it is backed with PUL. The fabric is pretty and it is just the right size. I used this on CD2 overnight and it held everything in. It washed great and left none to minimal staining. It washed great and I dried this is the dryer on low and it came out perfect. I really like this and I will be adding another over night pad to my stash soon. I am hoping for animal print or owls. She has other size pads as well. Here are the prices for her other items. 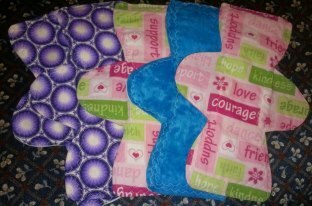 Here are a few pics of some of her other pads she has made. One lucky TTGG follower will be winning a pad of their own. 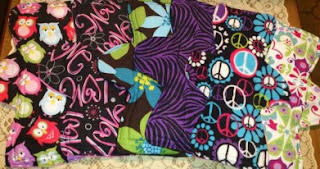 Peace signs or the giraffe fabric with pink lining. I like pink and black flowers! I like the floral fabric! I love the M&M print.